If you're new to cyber security, we've created an overview on this exciting field. Network outages, hacking, computer viruses, and similar incidents affect our lives in ways that range from inconvenient to life-threatening. As the number of mobile users, digital applications, and data networks increase, so do the opportunities for exploitation. Government agencies, the military, corporations, financial institutions, hospitals, and other groups collect, process, and store a great deal of confidential information on computers and transmit that data across networks to other computers. With the growing volume and sophistication of cyber attacks, ongoing attention is required to protect sensitive business and personal information, as well as safeguard national security. The curriculum has a flexibility about it that I haven’t seen from other academic institutions. UMUC, I think, has cracked the code in terms of allowing it to be very agile and very much focused on the changing dimensions of cyber security. Emma Garrison-Alexander, vice dean of cybersecurity and information assurance in the Graduate School, talks about her experience in the industry and how it guides her passion for teaching. When I mentioned UMUC, everybody’s eyes lit up in the room because they knew that the [cyber security] program had a good reputation in the industry. UMUC deserves the highest praise for recognizing and responding to the critical workforce need for trained professionals in the field…. It is an exciting time for cyber security, for the state of Maryland, and for UMUC. Learn cyber speak by familiarizing yourself with cyber security terminology from the Department of Homeland Security. The ability and means to communicate with or otherwise interact with a system, to use system resources to handle information, to gain knowledge of the information the system contains, or to control system components and functions. A computer connected to the Internet that has been surreptitiously/secretly compromised with malicious logic to perform activities under the remote command and control of a remote administrator. A model for enabling on-demand network access to a shared pool of configurable computing capabilities or resources (e.g., networks, servers, storage, applications, and services) that can be rapidly provisioned and released with minimal management effort or service provider interaction. The systems and assets, whether physical or virtual, so vital to society that the incapacity or destruction of such may have a debilitating impact on the security, economy, public health or safety, environment, or any combination of these matters. The use of mathematical techniques to provide security services, such as confidentiality, data integrity, entity authentication, and data origin authentication. The interdependent network of information technology infrastructures that includes the Internet, telecommunications networks, computer systems, and embedded processors and controllers. The unauthorized movement or disclosure of sensitive information to a party, usually outside the organization, that is not authorized to have or see the information. The processes and specialized techniques for gathering, retaining, and analyzing system-related data (digital evidence) for investigative purposes. A comprehensive approach to risk management that engages people, processes, and systems across an organization to improve the quality of decision making for managing risks that may hinder an organization's ability to achieve its objectives. The measures that protect and defend information and information systems by ensuring their availability, integrity, and confidentiality. The process and methods for analyzing information from networks and information systems to determine if a security breach or security violation has occurred. The numerical value used to control cryptographic operations, such as decryption, encryption, signature generation, or signature verification. Software that compromises the operation of a system by performing an unauthorized function or process. An actual assault perpetrated by an intentional threat source that attempts to learn or make use of information from a system but does not attempt to alter the system, its resources, its data, or its operations. An evaluation methodology whereby assessors search for vulnerabilities and attempt to circumvent the security features of a network and/or information system. A digital form of social engineering to deceive individuals into providing sensitive information. The level of confidence that software is free from vulnerabilities, either intentionally designed into the software or accidentally inserted at any time during its lifecycle, and that the software functions in the intended manner. A computer program that can replicate itself, infect a computer without permission or knowledge of the user, and then spread or propagate to another computer. Big Data: Dream or Potential Nightmare? : The vast amount of data being generated in our technologically connected world presents cyber security concerns. Unlocking the Secrets of Cyber Security: UMUC Cyber Security Program Advisory Board members discuss the challenges of hacking, tracking, and attacking in the virtual world. 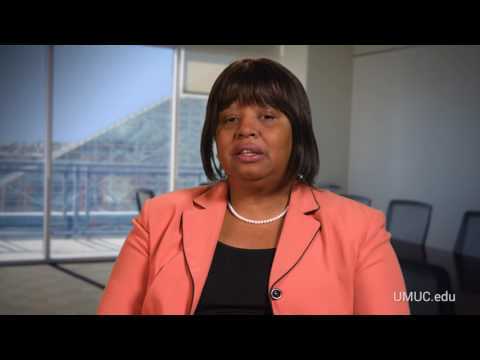 Table of Experts: Cybersecurity: Three cyber security experts, including Emma Garrison-Alexander, vice dean of cyber security and information assurance in the Graduate School at UMUC, discuss the top risks and critical importance of cyber security to today's businesses. Larger State Commitment Needed to Protect Cyber Data: UMUC faculty member Debora Plunkett called for more investment into cyber security defense in remarks to the Maryland Cybersecurity Council on January 25, 2018. Six Must-Reads for Your Cyber Book List: When you assemble your next cyber security reading list, start with these recommendations.